Learn why the carbon trading gamble and ‘Clean Development Mechanism’ won’t save the planet from climate change and why African civil society is resisting. 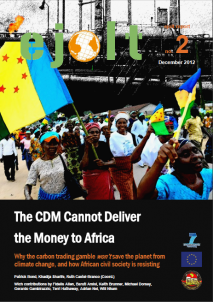 Read the second EJOLT report, “The CDM in Africa Cannot Deliver the Money”, by the University of KwaZulu-Natal Centre for Civil Society and Dartmouth College Climate Justice Research Project. A dozen researchers from around the globe, under the guidance of Professor Patrick Bond, explain in full detail – and through case studies from South Africa, Niger, Kenya, Mozambique, Ethiopia, the DRC and Tanzania – why the Clean Development Mechanism (CDM) is failing. The West’s strategy to reduce emissions is causing more harm than good to Africa –the continent that contributes the least to climate change but that suffers the heaviest toll. Disguised as a ‘solution’ to the climate change crisis, the CDM is now creating a second injustice above this existing injustice. The 105 pp report can be downloaded from here. It is being launched today in Durban at the Bisasar Road landfill (Africa’s largest, and a major CDM pilot); in Addis Ababa at the African Carbon Forum of carbon traders which begins this morning; in Hanover, USA, at Dartmouth College (whose president, Jim Yong Kim, was this week chosen as World Bank president); and in Brussels at the Northern Alliance for Sustainability, in advance of today’s European Union Environment Ministers meeting which will deliberate on a bail-out for the crashing EU carbon market. Across Africa, the CDM subsidizes dangerous for-profit activities, making them yet more advantageous to multinational corporations which are mostly based in Europe and the US. In turn, these same corporations can continue to pollute beyond the bounds set by politicians especially in Europe, because the EU’s Emissions Trading Scheme (ETS) forgives increasing pollution in the North if it is offset by dubious projects in the South, especially in China, India, Brazil and Mexico (the main sites of CDMs). But because communities, workers and local environments have been harmed in the process, various kinds of social resistances have emerged, and in some cases met with repression or ‘divide-and-rule’ strategies. EJOLT is a large collaborative project bringing science and society together to catalogue ecological distribution conflicts and work towards confronting environmental injustice. More info on EJOLT. We would be grateful if you could spread news about this report.